With a pitch on both sides, double-hipped conservatories stand as a striking addition to any home. This impressive design also allows greater versatility, for a better fit. 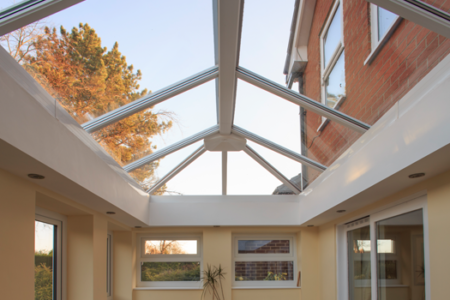 Your new lantern roof will benefit from the industry leading Liniar system. The thermal twin-walled top caps, which are unique to us, retain more heat within the conservatory when it’s cold in the winter, saving valuable energy and making it more economical to heat. There will be no gaps or holes with Liniar’s intricately engineered roof design. You can be sure there will be no water ingress, and your new double hipped conservatory will remain leak-free. There is a range of optional accessories that can help you achieve your desired aesthetic, whether classic or contemporary, for the ideal finish. 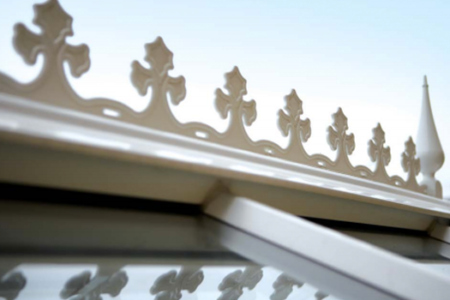 When you come to order your Liniar roof, there is also a complete range of matching options available, allowing you to perfectly co-ordinate your conservatory. Cresting and a decorative finial are included in the roof kit as standard, or alternatively you can choose a blanking cap for a more modern appearance. A conservatory is a fantastic way to gain extra living space in your home, offering versatility and allowing you to maximise natural sunlight in your home. Liniar double-hipped conservatories come with our technically advanced roof system, providing excellent energy efficiency and perfectly match the Liniar range of uPVC windows and doors. Whatever you are looking to use your new conservatory for we are certain that you’ll be delighted with the finished article. The Liniar window range was designed from the ground up to utilise the latest in window engineering and technology. Liniar profile uses a unique multi-chambered design that considerably reduces the heat transfer in and out of a property, meaning less energy needed to heat a home and can save you money by reducing energy bills. Why not have a browse through the extensive Liniar range of doors and windows. The Liniar profile specialises in thermal efficiency, comprising a multi-chambered profile to ensure your double-hipped conservatory achieves A+ standards of thermal efficiency. Not sure a double-hipped conservatory is the one for you? Not to worry, have a look at the other styles Liniar offers. 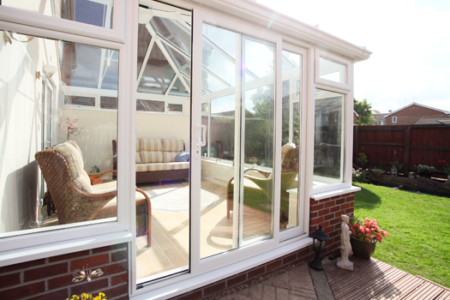 A Liniar double-hipped conservatory will add valuable space to your property. The big decision is – how do you use it? This versatile conservatory design offers a multitude of options; the addition of a Liniar lantern roof will really illuminate your conservatory with natural daylight. Installing bi-fold doors will open up your double-hipped conservatory, providing excellent access to and from the property. 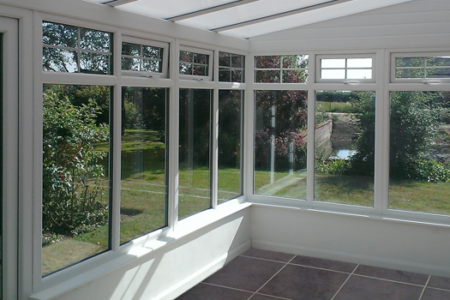 Alternatively, use your conservatory as a bright playroom for your children, or even convert it into a study. A Liniar lantern style roof makes a stunning statement of elegance and grandeur. Ideal for Georgian and Victorian period properties, the lantern style is often chosen to house swimming pools, orangeries or for larger conservatories. The lantern style dates back to the 19th century, with many stately homes still featuring them today, including Kew Gardens. A majestic and grand option for larger houses, lantern conservatories are spacious and allow an uninterrupted view of the sky.